What separates great tennis champions from the good tour players? That’s the question. Now, what’s the answer? Sure, there are many aspects to it and what works for one player doesn’t necessarily have to work for you but there are certain similarities between former tennis champions. The ability and desire to learn, win, and get better faster than others. Most people try to copy the people that are successful because they believe it also will help them achieve the same success. I never liked that approach because you don’t know other people’s struggle for success and it limits your creativity as a tennis player and person. On top of that it’s simply not true that you need to copy others to become successful! Instead you learn from others and make it your own until others try to copy you! 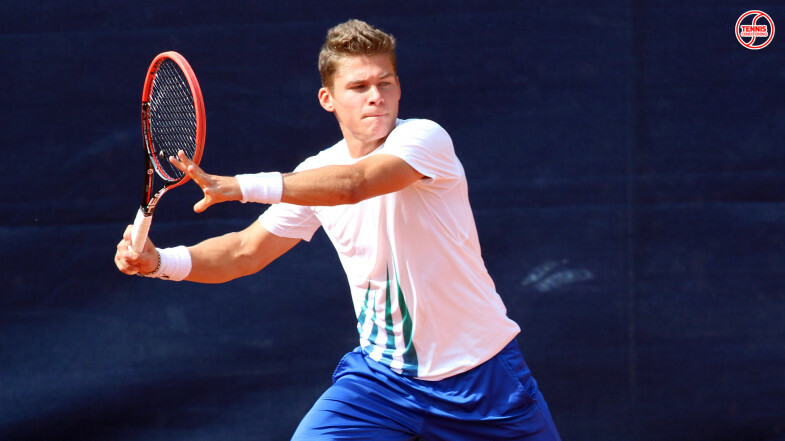 Take a look at the recent trend in men’s tennis where current top players hired former tennis champions to become part of their support team. Let’s take Roger Federer and Stefan Edberg as an example. Reality was that Federer had a tough time beating Djokovic, Nadal, Murray and the like. So Federer looked at what he was doing and analyzed what was preventing him from regaining the ability to win grand slams. For example, he couldn’t beat Nadal or Djokovic any more by simply playing the way he did from the baseline. He didn’t attack the net, play serve-and-volley or chip and charge. Instead of giving up or going through the motions he thought about what he needs to do and found a solution – he hired Stefan Edberg and went to work. If you want to learn how to attack the net and become dominant there then why don’t you work with a guy who used to win grand slams and become number one in the world playing like that? It took some time and adjusting but you can clearly see that Federer at his age was eager to learn and had the ability to make it happen on the court! You can see him attack the net more, play serve and volley and even chip and charge. How many of you can say that they improved certain things in a timely fashion and were able to play like that in a match where it counts? Still not convinced? Simply look at history, compare the greats of their time and answer the question how similar these guys and gals were? For example, when Nadal was winning a lot of matches many people said that you have to play with topspin like him to be successful…really? Then how come del Potro won the US Open hitting the ball hard and flat most of the time? Or take the era of the big guns like Sampras, Becker, Ivanisevic, Phillippoussis, Korda…many were saying you must have a big serve to be great…really? Then how come Leyton Hewitt or Andre Agassi made it to number one in the world and winning grand slams even on grass? I could go on and on…so these previous examples just illustrate that you don’t need to copy what’s already out there in order to become successful. Instead, find your own way and make your own decisions! So what does it take to become a tennis champion? As I mentioned in the introduction it is the ability and desire to learn, win, and get better faster than others. But what are the areas to focus on? You hear folks say the mental is most important for success, or if you speak to strength & conditioning coaches then they’ll tell you that you have to be fast and strong and your tennis coach tells you to hit the ball this way or that way. 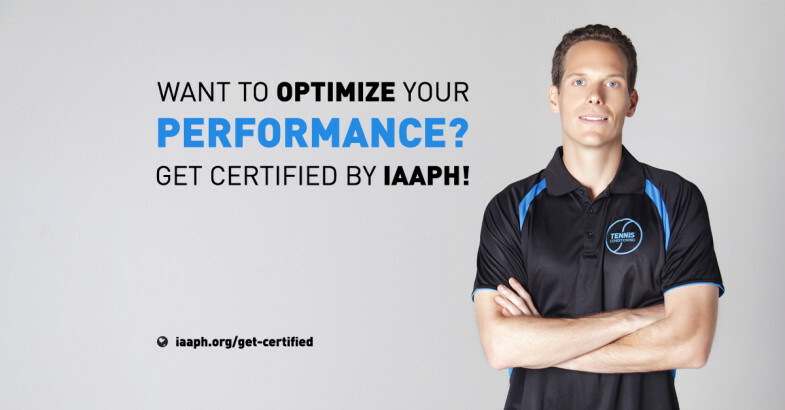 Therefore, you would need to work on all three of these areas continuously if you are serious about becoming a tennis champion. That doesn’t mean that you will master all 3 of them – the way to perfection is the goal! So What Could Be a Solution? One way is finding a mental health professional that can provide you with mental exercises to train your brain so that you finally can get over the hump and perform better during the big points. It’s not like in the movies where you are lying on the couch, talk a bit about your problems, and the mental health professional provides you with the solution and a few pills to take. Yes, you read correctly, you have to do all the work! You have to train your brain the same way you would train your muscles! That means in reality that you are designating time in your training schedule where you are doing brain-training exercises. Most likely you have to try a few different health professionals until you found the one method that works for you and/or that you believe in. Either way it’s worth your while. This is another example where you cannot simply copy what someone else is doing because you have to find the key that works for you! Just know that the sooner you deal with reality, the quicker you will be able to turn things around! But the mental toughness part doesn’t simply deal with battling anxiety. It also focuses on finding a way for you to win, which could mean that you need to improve your tennis smarts, meaning you need to know about court awareness (where am I on the court and where is my opponent) and where, when and how to hit the tennis ball. and these pieces allow for various options. The more options you have and can apply in a smart way the more matches you are going to win. present you with various option. So the more strokes you can hit consistently and execute well, the more options you have available to beat your opponent, which is one reason why Federer is so great. He can execute all the shots and has the tennis smarts to know when and where to hit what kind of ball. 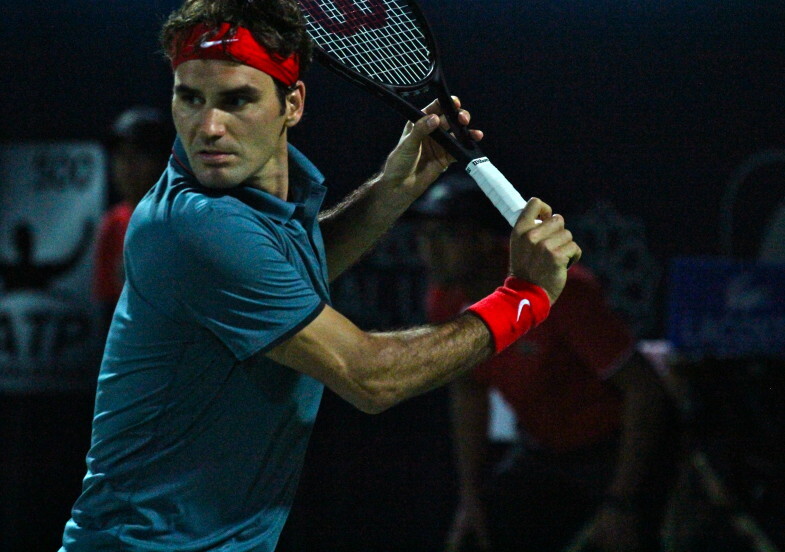 One example of that is his backhand slice hit with pace onto the service line in the middle of the court. It looks like an easy shot but that slice is very nasty because it stays low and comes with great pace, which makes it very difficult to hit a good ball over the net when you are positioned inside the court and close to the net. Although this shot was tough for many players, Nadal and Djokovic found answers. They were able to figure it out and hence forced Federer to come up with another way to beat them. This is the way tennis champions push themselves to get even better and continue to work hard! So in reality they are watching hours of video footage where they analyze themselves and their opponents. Then they come up with a game plan and hire the best people available to help them get better so that they can win grand slams. How many of your previous matches that you lost did you watch? How often do you spend the time to analyze your opponent’s strengths and weaknesses? Yes, this is where you spent the most of your time and it’s fun – hitting balls on the court. As I previously demonstrated in the Federer example, it is helpful to be able to execute various shots because it gives you more options. Yet it doesn’t mean you must be able to hit every shot in tennis in order to win. Take former tennis champion Martina Hingis for example, she didn’t have big shots or a huge serve but she was killing opponents on the court because of her tennis smarts. As you can see, it’s another example that supports the idea that you should find your own way to success and don’t simply copy what others do. Generally speaking though it is advantageous to develop weapons because you will have to spent less time on the court, which means less stress on your body, which means the likelihood increases that you could have a successful career for 10+ years without any major injuries, such as Roger Federer. There are exceptions to the rule but most of the baseline grinders, such as Lleyton Hewitt, faded away over time because you cannot push yourself to the limit every day without a decline in performance. Therefore, having a weapon such as a big serve or forehand can become handy because they can give you quick and easy points when you need them, which pays off in the long run of winning a grand slam for example. 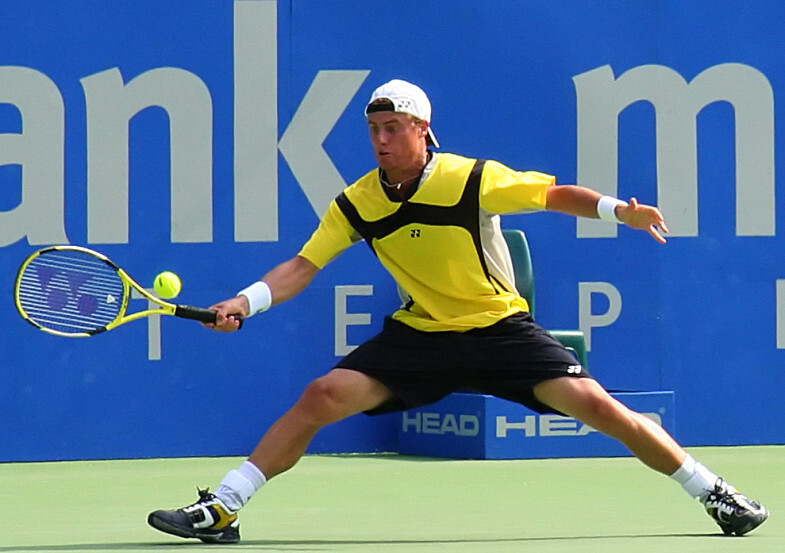 “Lleyton hewitt medibank international 2006 01“. Licensed under CC BY-SA 2.5 via Wikimedia Commons. If you don’t have any big shots then your weapon is called consistency and that can take you all the way to the top as well. It has been done before; just watch David Ferrer, Tommy Robredo, Martina Hingis, Bjorn Borg or Lleyton Hewitt play. But you don’t simply have to become a ball machine to have success. Matter of fact, you want to force your opponents to make mistakes because that upsets them more than you hitting winners, which means they lose their mind on the court and you win! But how? Play unorthodox or nasty like Fabrice Santoro or Rafael Nadal! Before Nadal came onto the scene nobody played with such heavy spins and curve balls but when he became more and more successful all of a sudden many juniors tried to play like him. Or take Fabrice Santoro as an example. I loved to watch him play, slicing and dicing with his two-handed forehand and 2-handed volleys and he was rather short. Now the tennis conditioning is important as well because it directly impacts how successful you are going to be and for how long you can play at that level. Of course I could give you the whole spiel of why this is great, or why you should do that. Having great dynamic balance is important because it enhances your control of your body and the ball during shots, which allows you to do more with the ball. In general, you can do a lot of single leg or single arm action on the court or in the gym because that engages and enhances the stabilizer musculature, such as the DB Military Press. You can even use dynamic warm up exercises that also help you develop dynamic stability instead of simply warming up the musculature, such as the SL Squat & Quad Stretch. Being able to move well on the court is a necessity for most tennis players but how important footwork is depends on a few things, such as your style of play. Developing good footwork is more of a tedious process where you want to focus on optimizing speed economy so you don’t waste any energy for undesirable movements. Many tennis conditioning coaches like to use the speed ladder, cones or hurdles when working on footwork because they are also easy to carry with you to tournaments and can also be used for warm ups. Agility drills are usually more fun and can be done directly on the court. It is important though to first focus on learning perfect change of direction technique before the focus shifts to maximizing speed of the action. Otherwise energy transfer capabilities may be compromised and the risk for injury increases. Watch the following video that shows you how to improve your agility. Working on tennis specific endurance is important because you want to be able to perform well for the entire duration of the match or tournament in order to win points. That cannot be accomplished if you fatigue early. Not by steady-state jogging because it is not a tennis-specific endurance training. You have to run in multiple directions during tennis and tennis is not an endurance sport like a marathon or long distance swimming. If it interests you find out more why steady-state jogging is a waste of time from a tennis conditioning standpoint. A better alternative is multidirectional interval training because it emulates the movement patterns on the tennis court and is energy system specific. Recovery is important if you want to be able to win tournaments because you will have some tight matches on your road to the title and how well you can recover in between plays a role in success or failure. For the most part that means being able to deal with best-of-three matches unless you are making it to the grand slams where you have to play best-of-five from time to time if you are playing the men’s tour. If you plan on taking any pills ensure that they don’t include banned substances, otherwise you run into the risk of doping. We have 22 static stretching exercises for your tennis cool down that you could incorporate into your post-match static stretching routine to reduce muscle soreness the following day. You should take really good care of your body because you can only play your best tennis if you are feeling good. Therefore, the majority of the tennis champions spend a considerable amount of their training time on getting their bodies into tip-top shape and maintaining what they have. Nutrition also play a vital role in maintaining your body, your machine, because it provides building blocks your body can use to repair itself. In order to support the repairing process it is vital to get enough sleep because that is the time when muscle tissue etc. is being repaired. Ok, so that is a lot of information for you to digest and I hope you’ll find something here and there that’s beneficial to you. If you like what you saw I recommend you share it with your friends and bookmark this page so you can come back to it whenever you want. If you have something to add don’t be shy, just use the comment section – I’m always interested in your opinion!